Added vinegar for effective cleaning of all your glass and window surfaces. Cuts through tough grease and grime. Cleans to a streak-free shine. Leaves all glass surfaces smear free. For quick and easy glass surface cleaning. Mr Muscle knows cleaning should be as easy as possible, which is why he?s created a single product for all of your window cleaning needs. 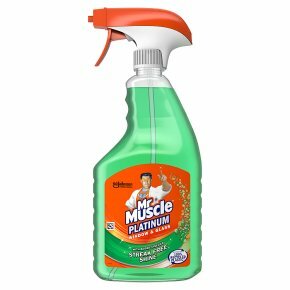 Mr Muscle Platinum Window and Glass gives you the power to defeat tough messes on windows and glass. Turn nozzle to "SPRAY" position. Spray directly onto surface with full trigger strokes. Wipe with kitchen paper or a soft dry cloth for sparkling results. When finished cleaning, turn nozzle to ?STOP? position and store bottle upright. Do not use on finished wood. On surfaces other than glass, mirrors, tiles and chrome, test on an inconspicuous area first. WARNING<br>Causes skin irritation. Causes serious eye irritation.<br>If medical advice is needed, have product container or label at hand. <br>Keep out of reach of children. IF IN EYES: Rinse cautiously with water for several minutes. Remove contact lenses, if present and easy to do. Continue rinsing. If eye irritation persists: Get medical advice/attention. Do not breath spray. Wash hands thoroughly after handling. Use only in well-ventilated areas. As with any household product avoid prolonged skin contact with this product.